Uncleanliness give infection to the skin. Infection of the skin is distinguished from dermatitis, which is inflammation of the skin, but an infection of unclean skin can result in skin inflammation. That is why, keeping it clean and glowing is good for skin health. Skin inflammation due to skin infection is called infective dermatitis. Unclean skin infections may present as either a superficial or deep infection of the skin, hair, and/or nails. They affect people who do not take proper care of their skin. Similarly, having a dull skin blotchy and lifeless is really a nightmare, regardless of our age or time of year. We are sharing some information on home remedy tips which help in keeping skin fresh and glowing. These tips help in preventing external skin diseases. It also help in skin infection (dermatitis) – if you are looking for beauty tips to clear your dermis, please read the complete article where you will know about the best home remedies for skin whitening. 2 The Ultimate Skin Care Tips for Men/Women of Any Age! Undoubtedly, women want to have beautiful skin 365 days a year, completely “porcelain”, uniform, no stains, no wrinkles, no pimples, blemish-free, apart from age, sun exposure, etc. For this we can reap the benefits of mother nature and build our own kit “cosmetics first aid” to remove the dark parts of our skin, especially the face. The patches of skin may be due to several factors, but mainly to exposure to ultraviolet rays improperly or without moisturize enough after going to the beach. And may be due to hormonal changes such as pregnancy or during the period, or over time. Nimbu (lemon) is a natural and very effective product, known for its skin lightening for its high content of vitamin C, which is excellent for regulating the production of melanin. This substance is responsible for providing color to the skin. Moreover, because the lemon contains citric acid, helps in cell renewal. You must directly rub a slice of this super food on the face or the skin you want to clarify. You can also soak a cotton ball and apply with the juice through the skin. Note that after treatment you can not go out that day. Seize the weekend or a holiday for it. Otherwise, your skin will stain further. Onion and more specifically its juice, which contains sulfur and vitamin C. It is undoubtedly an excellent ingredient to have healthy skin all year. Should be used externally if desired diminish wrinkles, blemishes or acne marks. It also serves to stimulate hair follicles, disinfect wounds and eliminate dandruff. Sprays a red onion in blender and soaked with that juice cotton, which should apply the patches. Leave on 10 minutes and washed with cold water. Note that if the area is irritated may experience some burning. If it is unbearable, rinse immediately. Apple cider vinegar is one of our infallible remedies lists, both for health and for the beauty allies. This is because having an acid pH, good to close the pores and simultaneously achieve a smooth and shiny skin. To apply, just soak a cotton ball with apple cider vinegar and place on the stains, leave on for about 20 minutes and then wash with cold water. You’ve probably heard that Cleopatra, the queen of ancient Egypt, their beauty routines based on the use of fermented sour milk. Lactic acid baths used to drag the dead skin cells, leaving it soft and clean. It also has excellent bleaching properties, which help to achieve an even tone, restitute the brightness and blur the periodic use small spots. 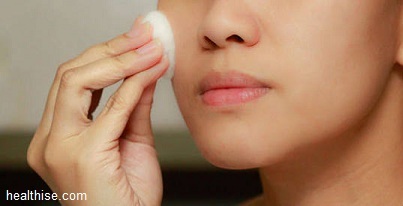 You can make a “facial peel” using milk, cotton dipped in warm or mild liquid. Leave it overnight and rinse in the morning. Their properties are similar to those of milk, as a derivative, but also serves to disinfect, smooth pores, promote healing and regeneration of the dermis, maintaining skin moisture, etc. The starter cultures used to prevent skin barrier to be bactericidal infections. 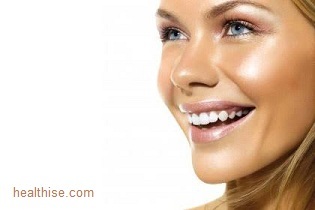 The application of skin lightening yogurt is used as a mask. Wash your face with mild soap and water. Place a generous amount of yogurt spreading it with your fingers or brush. Let stand about 20 minutes and remove with warm water. 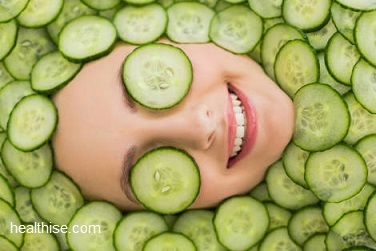 A typical image of beauty treatments is to use cucumber slices for eyes, because having lots of water, rest eyelids. In addition, cucumber is rich in vitamin E and essential oils. This makes it an excellent ally when it comes to clarify the skin and leave really beautiful. Provides softness, removes stains and wrinkles. It is necessary to peel a cucumber, remove seeds in a blender and process until a paste forms. Applied to the skin for 20 minutes and rinse. The results are almost immediate.